Pork Jhol aka Bengali Pork Curry (the runny one) has never been a regular Sunday pairing for rice at home. I do make it, however, not as regular as Murgir Jhol or Khashi/ Pathar Mangshor Jhol. I hardly make pork once in a month or so especially now when we are in Kolkata. Gurgaon, though was a different case altogether. Getting Bengali style Pork Curry there was difficult (we were therefrom 2010-14). Needless to say, I used to cook it at home more frequently then. In Kolkata, however, Pork Jhol is easily available though not the thing Iwemake at home. 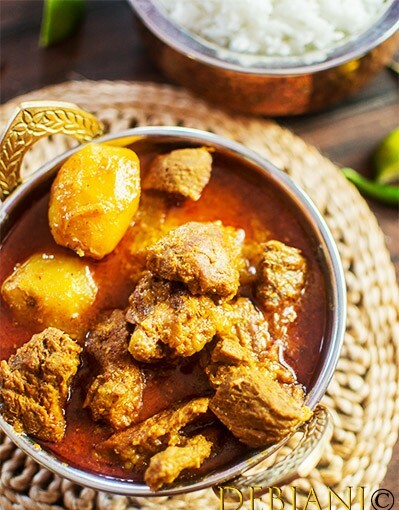 The Roadside curry is a rich gravy based Pork curry with no added Potato. Pork Jhol (or Pork er Jhol) these days probably is an in thing in the city of joy at least according to the Social media geeks (over-enthusiasts should I say :P). Not that Pork Jhol is a new culinary invention; in fact, quite a common item cooked for typical Sunday lunch over the years by the families those enjoy pork. There are several roadside joints that sell the Pork Jhol. The shop near Garia Station or Howrah’s Fatikdar dokan is almost cult pork jhol sellers. The Pork Jhol they sell is mostly a runny Pork Curry. The Pork Jhol I make at home is a comforting version prepared with Aloo! Yes, true blue bong me cannot think of Mangshor Jhol without the big fat Potato Chunk :). We enjoy this with a spoonful of Gobindobhog Chaler Bhat (okay, a few spoonfuls actually 🙂 ). Another thing I must mention, Me and the family, for that matter, don’t prefer fat along with the meat (belly, however, is an exception). Though I and Mehebub love the roadside Pork Jhol and enjoy once in a while (or maybe in a blue moon) but these days I prefer to cook it at home given Pasta has a thing for Pork! She loves it! In fact, She loves both beef and pork, for that matter! I don’t much rely on the quality of the pork available in the roadside shops and hence, ended on sourcing from the known shops whenever I make it. As I already mentioned, my Bengali Pork Curry is incomplete without Aloo. Another thing I make sure to use while cooking is Bengali Garam Masala for the distinct “Bong” flavor. My recipe calls for plain curd as well and no use of Tomato. Here I must mention a trick I learned from our landlady in Gurgaon. She used to say to never mix Curd with the tomato while making Bengali or Odia meat curries. That combination may leave your stomach unhappy in case you are having the meat in excess! Well, I don’t know how far it is true but I skip Tomato while cooking the runny curry with red meat. Plain curd works well as a tenderizer as well as a souring agent. In case using Tomato, just reduce the amount of curd to balance the curry. Oh, my recipe for Bengali Pork Jhol calls for Ghee (the way I use it to make mutton or beef) and needless to say, you can skip that too! Okay, one last tip! I prefer to make a spice paste and add that afterword instead of adding the spices directly while cooking! 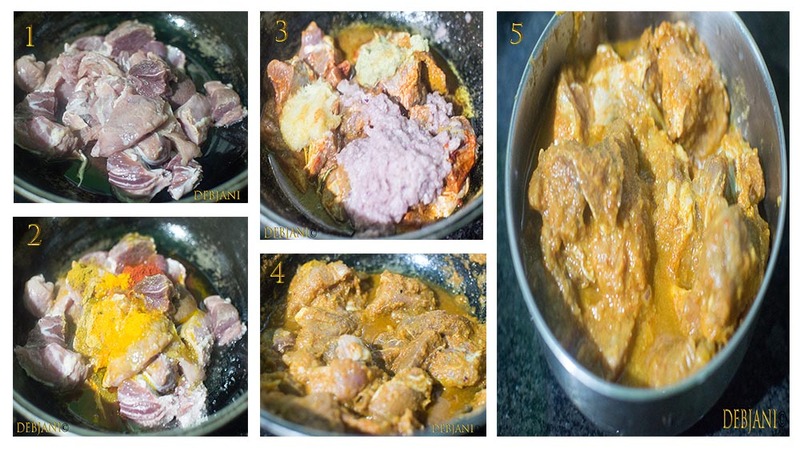 Easy Bengali Pork Curry aka Pork jhol step by step recipe with pictures. Bengali Garam Masala Powderl: 1 Tsp. Kashmiri Red Chili Powder: ⅓ Tsp. Wash the meat thoroughly and pat dry before marinating. Marinate Pork chunks with Onion Paste, Ginger Paste, Garlic Paste, Cumin Powder, Coriander Powder, Kashmiri Red Chili Powder, Sugar and Mustard Oil overnight or for 8 hours. Mix Cumin Powder, Coriander Powder, Kashmiri Red Chili Powder and Sugar with Mustard Oil to make a thick paste. Leave it for 15 minutes before adding to the curry (while making). Peel the skin and cut potatoes into halves or 4 pieces considering the size of the potato. You may refer to the picture. Chop the Onions roughly. Thin slices would obviously do. In a deep bottom pan, heat the Oil and start frying potatoes after sprinkling the Turmeric Powder and Red Chili Powder. The spices are used to give a lucrative color to the potatoes and the gravy as well. Once fried, strain the potatoes from oil and keep aside. It may take 3 minutes to fry potatoes properly on medium heat. Now temper remaining oil in the pan with Red Chili, Bay Leaf, Cinnamon Stick, Clove, Green Cardamom and Black Cardamom. Add Sugar and let it caramelize. Now add chopped onion and fry on low flame till onion turns translucent in color. Add Ginger and Garlic Paste along with 1 Tbsp. of Water and cook on low flame until the raw aroma of the paste goes away completely. Add plain curd and mix vigorously to avoid granulation of curd (curdling actually). Now add the Spice paste and cook over low flame until oil releases from the side of the mixture in pan. At this point add Salt and mix. Now add marinated pork along with the marination mix and give the entire thing a thorough mix. Start cooking on low flame and stir in between. Cook for around 10 minutes and then add fried potatoes. The Pork will release moisture and hence no need to add water separately. Cook for around 15-20 minutes by covering the pan with a lid. Cook until the meat reaches desired softness. If required add little water and bring it to boil. 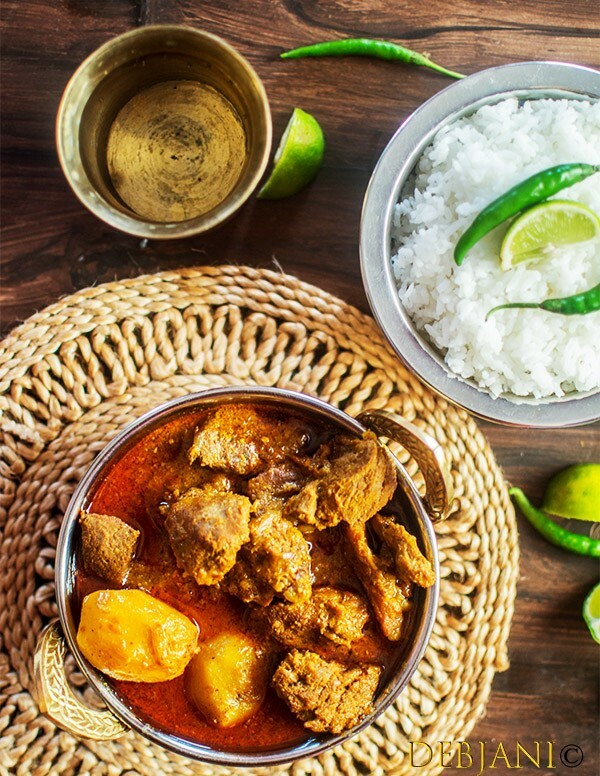 Finish the Pork Jhol aka Bengali Pork Curry with Garam Masala and Ghee (okay, optional)! Serve it hot with your choice of carbohydrate. We prefer to have it with Gobindobhog Chaler Bhat. Salt to be adjusted as per taste. Don't add it while marinating the meat. Adjust Chili Powder as per taste. I use Kashmiri Red Chili, which gives an amazing color to the gravy and the hotness is moderate. Both Ghee and Garam Masala are optional however required to add if you are craving for the "bong"-ness. I prefer to use Mustard Oil to make the Pork Jhol which is again optional. You may substitute it with vegetable oil however, that will not give the typical aroma that comes from mustard Oil. If curd is not available to substitute it with Yogurt. 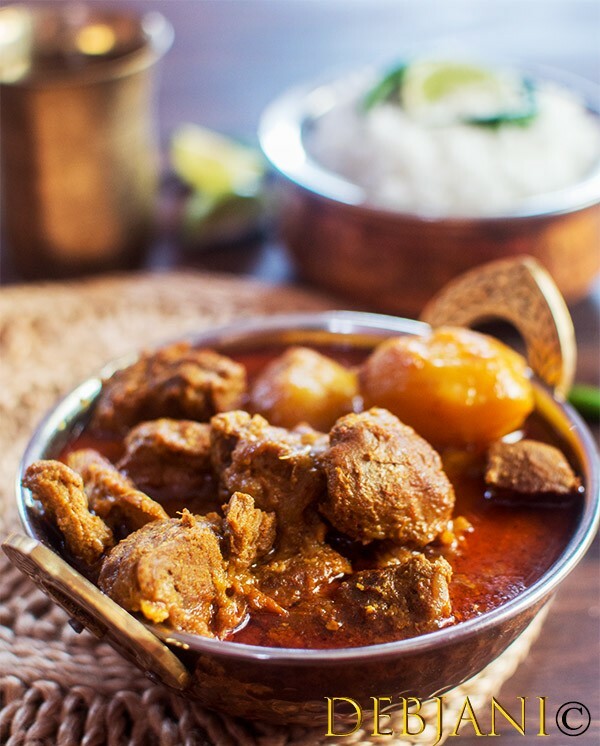 Last but not the least, I use almost no fat pork to make the Bengali Pork Curry. If you are using pork with fat (80/20 or 70/30) reduce the oil for sure. In that case, the pork will be cooked in its own fat. Okay, one more! Cooking time will be different based on the meat you are using. Hence, you need to check while cooking. I don't use a Pressure cooker to make the Pork Jhol which can obviously be used. However, my preference is slow cooking. 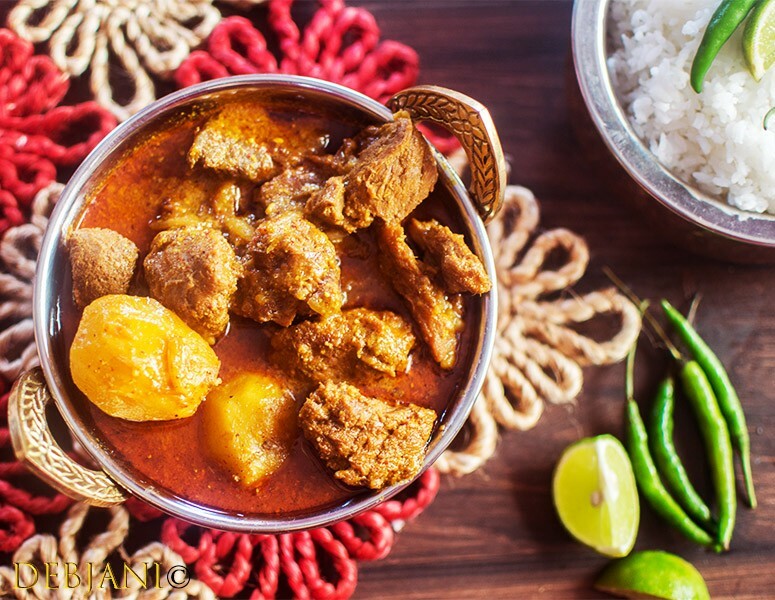 Have you tried the Pork Jhol aka Bengali Pork Curry Recipe from Debjanir Rannachar!